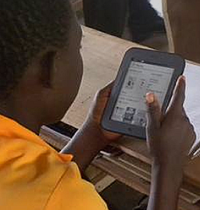 DC Salon: How Is ICT Impacting Education in Rwanda? How is ICT Impacting Education in Rwanda? Rwanda is at the forefront in using technology to increase national development with ICT enshrined in the national Vision 2020 policy, more than 3,000 kilometers of fiber optic cable installed across the country, and 4G LTE mobile data networks soon to follow. To improve education, the Rwanda Information Technology Authority, the Ministry of Education, and multiple development organizations are active in promoting the use of ICT in schools with a plethora of ICT in education initiatives, like USAID's Rwanda Education Commons and OLE Rwanda' Teachermate pilots. How are these initiatives increasing teacher capacity? Are the changes visible in the classroom? When will students leap ahead of their East African peers? And most of all, what is the real impact of ICT in education for Rwanda? Please RSVP now to join David Rurangirwa, ICT/Education Specialist for USAID/Rwanda and Jacques Murinda, Executive Director, OLE Rwanda for the next Technology Salon in DC to discuss how ICT in all its forms can increase educational outcomes in Rwanda. Weâ€™ll have hot coffee and catered breakfast for a morning rush, but seating is limited. So RSVP ASAP to be confirmed for attendance: once we reach our 30-person capacity there will be a waiting list. How Can We Scale M4D Initiatives? According to the latest GSMA statistics, nearly 50% of people own a mobile phone in the developing world and nearly 70% have access to mobile phones. With mobile access increasing daily, opportunities to use mobiles in development initiatives continue to grow and expand. Mobiles for Development (M4D) has attracted investment from mobile operators, entrepreneurs, investors and international development agencies â€“ all working to generate social impact and improve wellbeing at the base of the pyramid. However, efforts to scale m4d initiatives and make them sustainable have largely failed. 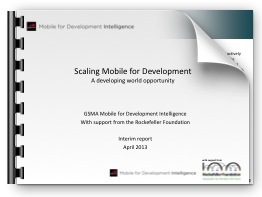 The GSMAâ€™s Mobile for Development Intelligence (MDI) Groupâ€™s report "Scaling Mobile for Development: A developing world opportunity" highlights the issue of sustainable and scaled impact as the central challenge (and opportunity) in M4D over the next five years. But what do we mean by "mobile"? And what do we mean by "scale"? And how can different actors overcome the challenges and take advantage of the opportunities in the M4D field? What does â€œscaleâ€ mean? What does â€œmobileâ€ mean? What exactly do we mean by M4D? What are the elements of the ecosystem that are required for scaling M4D? What are the barriers to reaching scale? How can we overcome them? How can M4D programs be sustainably financed? And at what stage should this be worked out? What successful business models exist? What can we learn from them? What are the non-technological elements that influence success and scaling of M4D programming? What is the role of different stakeholders, including users, innovators, social entrepreneurs, technology companies, international and local development organizations, mobile network operators, and governments? Weâ€™ll have hot coffee and breakfast snacks for a morning rush, but seating is limited. So RSVP ASAP to be confirmed for attendance: once we reach our 30-person capacity there will be a waiting list.